After you add your item to the cart. See "Note to Seller" to write me a note about your ring size, band width, finish, fit and color choice. 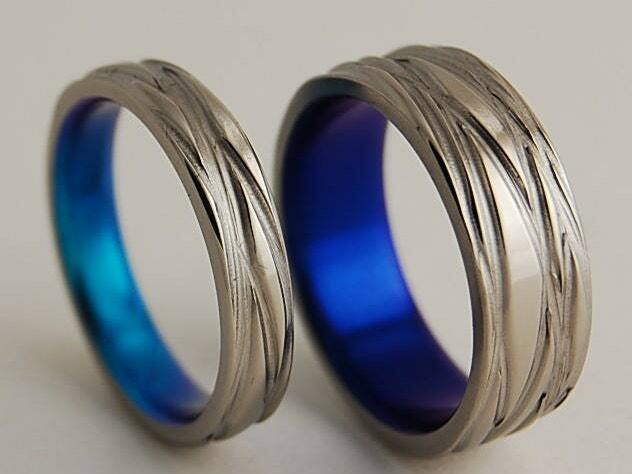 Beautiful rings. The grooves are not rough and the blue is very vibrant. Got the rings pretty quickly too. I am a panic-er so I emailed and asked if they would be delivered by my wedding date and I got a very fast response. They came in separate ring boxes wrapped and in a shipping box so no damage to them at all. The rings are beautiful! Lightweight and came earlier than I expected. The colors are much less vibrant in real life than in the photos, but still very pretty.